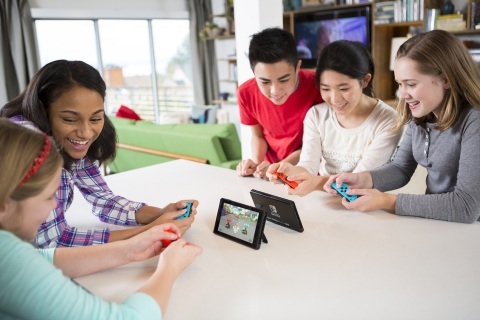 REDMOND, Wash.--(BUSINESS WIRE)--According to the NPD Group, which tracks video game sales in the United States, the Nintendo Switch system was the best-selling video game hardware in the month of April with more than 280,000 units sold. This is the second month in a row that Nintendo Switch has led the pack in video game hardware sales, following a record-breaking launch in March. April sales of Nintendo Switch and the Nintendo 3DS family of systems (more than 68,000 units sold) combined to make up almost half of all hardware sales across all dedicated video game systems. The Mario Kart 8 Deluxe game was the top-selling video game in April with more than 460,000 physical units sold. With digital sales added, the total is more than 550,000 units. Making this number more impressive is the fact that Mario Kart 8 Deluxe launched on April 28, which only accounts for two days’ worth of sales in the reporting period, which cut off on April 29. The Legend of Zelda: Breath of the Wild game for Nintendo Switch continued its legendary run, coming in as the third-highest-selling video game in April. The critically acclaimed open-air adventure will receive even more content with the upcoming launch of two DLC packs in the summer and holiday season of this year. The DLC is now available for pre-purchase via an Expansion Pass. 1-2-Switch and digital-only game Snipperclips – Cut it out, together! also saw strong sales in April. Nintendo will look to continue this momentum into the summer with a series of great new games for Nintendo Switch and Nintendo 3DS. The upcoming lineups for both systems include Fire Emblem Echoes: Shadows of Valentia (Nintendo 3DS, May 19), Ultra Street Fighter II: The Final Challengers from Capcom (Nintendo Switch, May 26), ARMS (Nintendo Switch, June 16), Ever Oasis (Nintendo 3DS, June 23) and Splatoon 2 (Nintendo Switch, July 21). Nintendo 3DS games Hey! Pikmin and Miitopia both launch on July 28, the same day as New Nintendo 2DS XL, Nintendo’s newest hand-held system. *Data regarding physical sales of games are from the NPD Group. Data regarding digital downloads of games and combined physical/digital life-to-date numbers are from Nintendo’s internal sales figures. All numbers, unless otherwise stated, are specific to the United States only.